Original Lobby Card Rex Allen "The Arizona Cowboy"
This is a rare original lobby card of the Movie "The Arizona Cowboy" starring Rex Allen. He literally was known as the Arizona Cowboy. He was the most loved and wonderful western personality who made great Western movies. This is one on him at his prime. 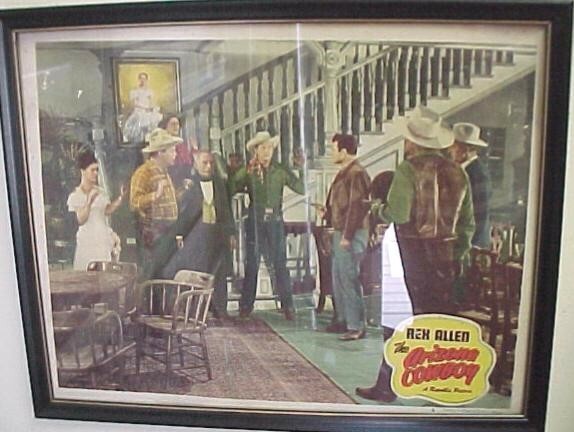 This is a rare original lobby card of the Movie "The Arizona Cowboy" starring Rex Allen. He literally was known as the Arizona Cowboy. He was the most loved and wonderful western personality who made great Western movies. This is one on him at his prime. Please email cowboycabin@centurytel.net with questions or call 406 270-2842.